The C-Platform is Sensor Unlimited’s next generation SWIR compact video cameras designed for applications requiring small Size, Weight, and Power (SWaP). 1.00 x 1.00 x 0.995 in. The C-Platform is Sensor Unlimited’s next generation SWIR compact video cameras designed for applications requiring small Size, Weight, and Power (SWaP). 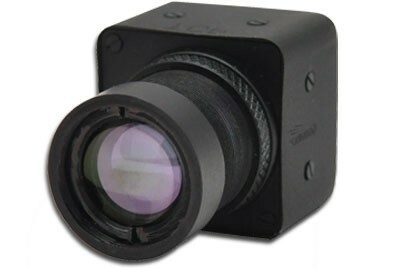 These cameras feature a 640x512 pixel, high-sensitivity InGaAs imager that does not require thermal stabilization and utilize Sensor Unlimited’s proprietary parameterized non-uniformity corrections algorithms to produce high quality imagery. The elimination of thermoelectric coolers enable the packaging of imagers and associated electronics for applications requiring very small size and low power draw. The camera provides real-time daylight to low-light imaging in the Short Wave Infrared (SWIR) wavelength spectrum for persistent surveillance, laser detection, and penetration through fog, dust, and smoke. On-board Automatic Gain Control (AGC) is employed to address the challenges of day to night imaging. Camera Link® digital output provides for plug-and-play video with 12-bit images for digital image processing or transmission. The light-weight and compact size enables easy integration into aerial, mobile and hand-held surveillance systems. Optional NIR/SWIR technology is available to extend the sensitivity of Sensor Unlimited cameras down to 0.7 µm, offering the advantage of both Near Infrared (NIR) and Short Wave Infrared wavelength response.